Fact: ticks are gross. But that isn't the entire picture. We are approaching tick season here in Yakima where we start finding these little parasites on our furry friends (and ourselves). Ticks are arachnids, meaning they have 8 legs and are in the same family as mites and spiders. They live in wooded areas and among grasslands and shrubs so we have many prime tick environments in our region. Ticks will crawl around on dogs, cats, and humans until they find a nice place to attach- somewhere warm and dark is a preferred area. We often find them clustered under collars, in armpits, and near the ears of our pets, though they can attach anywhere. 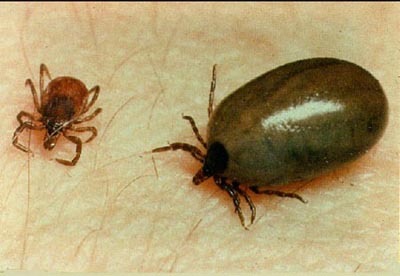 Ticks feed on blood by burrowing their heads under the skin of their host and remaining attached until they are fully engorged before dropping off the animal on their own. The problem with ticks is not just that they are disgusting and give us the heebie-jeebies. In large numbers, they can cause a dog or cat to become anemic (too few red blood cells). Ticks can also carry diseases such as Lyme disease, Rocky Mountain Spotted Fever, Ehrlichiosis, and Babesiosis. Even one tick bite can be enough to cause a potentially serious infection. How do we remove ticks? The goal is to remove the head and body all at once to prevent irritation or infection from leaving the head under the skin. If you are not experienced removing ticks, your veterinary team will be happy to remove them from your pet. While it may be tempting to make the tick ?back out? of your pet?s skin by applying alcohol, petroleum jelly, or a lit match, this may actually cause the tick to release more toxins into your pet?s bloodstream. These techniques are also not likely to cause the tick to stop feeding and drop off your pet. What should I watch for if my pet has had ticks? Low energy, painful swollen joints, vomiting or diarrhea, yellowing of the skin, gums, or eyes, pale gums, swollen lymph nodes, and fever are all signs of a potential tick borne illness. If we suspect a tick borne illness in your pet we may recommend several test including a CBC (complete blood count to look at the red and white blood cells), chemistry (to check liver and kidney function and rule out other problems), a urinalysis to look for infection, blood, or protein loss into the urine, and tick titers to determine exactly what disease we may be dealing with. Some tick borne illnesses will need multiple sets of titers to monitor their progression with treatment. How do we prevent ticks? An ounce of prevention is worth a pound of cure. There are many options for tick prevention on the market. Please consult with your veterinarian for a tick prevention plan appropriate to your pet. If we haven?t seen your pet for a while, we may recommend an exam to ensure they are healthy enough to have medication applied.